Russia will maintain a military stronghold in Syria for at least the next 49 years, after the two nations signed an agreement allowing Russian ships to port in Tartus. This is Russia’s foothold in the Middle East, and yet another example of how the country is expanding its military power globally. The agreement stipulates that up to 11 ships can be at the naval base at one time, according to Russian information service TASS. Nuclear-powered ships will also be able to use the base, as long as environmental safety precautions are honored. It is unclear what kind of ships will dock at the base, but the Kusnetsov has docked there in past. It was reported earlier this year that the Serpukhov, a small missile ship, will replace its Zelyony Dol. The Kremlin has been harshly criticized for its role in Syria’s civil war that began in 2011 when anti-government rebels began battling state government forces of President Bashar al-Assad. Russia, a longtime Syria ally, conducted airstrikes in September of 2015 to help keep al-Assad in power. Human rights organizations accuse Russia of firing indiscriminately on innocent civilians; between September 19 and October 18 alone, 446 civilians were killed in bombing campaigns, according to Human Rights Watch. In total, more than 400,000 people have died since the war started. The Russians will have wide-ranging freedom at the naval base, including “full immunity from the civil and administrative jurisdiction of Syria. 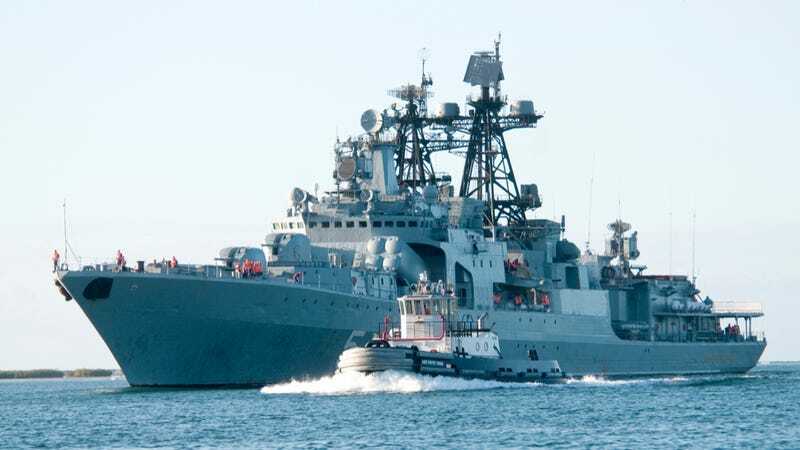 Its movable and immovable property enjoys immunity from search, requisition, arrest or executory measures.” The only other naval base Moscow has abroad is located in Vietnam. The Russian side has the right to bring to the logistics facility through the territory of Syria and evacuate from the logistic facility across Syria any weapons, ammunition, equipment and materials crucial to maintaining the security of the personnel and their families, crewmembers and Russian contractors and to performing missions by Russian ships without any duties levied by the Syrian side. While that may sound like a bunch of standard legalese, the stipulation allowing “any weapons, ammunition, equipment and materials crucial to maintaining the security of the personnel and their families” is an important one in context. Russia has used the excuse that it was “protecting Russians” in the very recent past to invade its neighbors, including Ukraine. Russia has had a presence at the Syrian base since 1971, when it was Syria’s top arms supplier. It was able to hold on to the base after the fall of the Soviet Union by forgiving up to 73 percent in debt to the Syrian government, which also allowed Syria to renew arms purchases from Moscow. The Tartus base gives Russia a significant presence in the eastern Mediterranean Sea, and it’s also important for Russia’s broader military power projection. Its most important foreign base is the Black Sea Fleet base in Sevastopol, Ukraine. (In 2014, Russia annexed Crimea, where the base is located, but most nations do not honor the move, making the base foreign.) If Russia wanted to deploy beyond the Black Sea, it had to go through the Bosporus Strait, which is under Turkey’s control, and Turkey is a member of NATO. Turkey has the power to close the Strait at its discretion, during either war or peacetime. This new 49-year agreement thus represents a huge geopolitical gain for Russia’s strategy, as it has a foothold in another body of water. If neither Syria nor Russia gives 12 months notice through proper communication channels that either party wants to cancel the agreement, the contract will automatically renew itself in 25 year intervals.